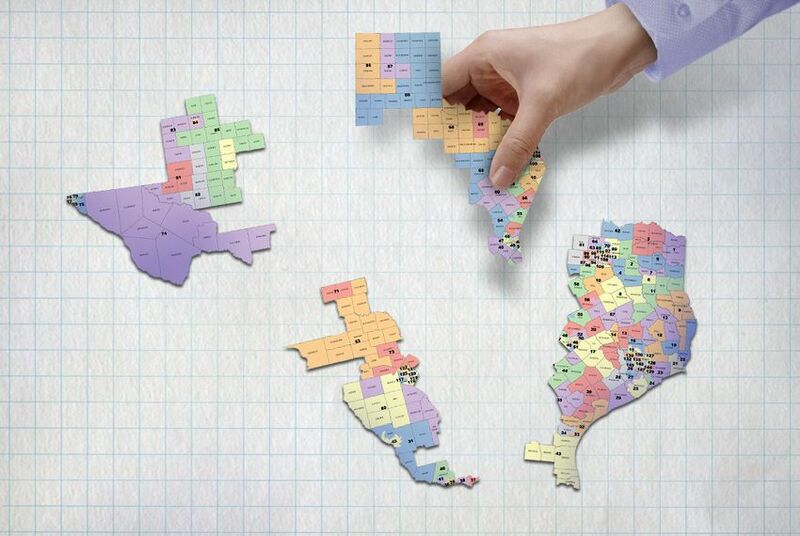 The Texas Legislature, trading turns with the federal courts, used this year’s first special session to approve new redistricting maps that will be in place for next year’s elections unless the courts object. Left alone, those maps will become state law in September. Before the first round of this decade’s redistricting in 2011, 97 of the 150 House districts voted, on average, for Republicans in statewide elections. In the maps approved by the Legislature this summer, that rose to 100 districts. The Democrats, conversely, fell to 50 from 53 before redistricting. More importantly, lawmakers cut the number of competitive districts in the House to 19 from 28 and the number of closely competitive districts to 9 from 22. They did that by making districts more distinctly partisan than before. Only five districts had the same political climate before and after redistricting. Eighty districts became more Republican — some by a little, some by a lot — and 65 districts swung a little or a lot to the left. That doesn’t always mean a district moved from the Democrats to the Republicans or vice versa. An overwhelmingly Republican district before might now be strongly Republican — with the voters drawn into other districts to strengthen Republicans or weaken Democrats. The San Antonio judges drew maps for use in the 2012 elections. Their first maps raised objections from Republicans, and the U.S. Supreme Court ordered them to draw new ones using as much of the Legislature’s work as they could. The timing of the court cases forced the state to delay its primary elections from March to May, and its runoffs from May to July. After those elections, the D.C. court found evidence of intentional discrimination by lawmakers in the Legislature’s maps for Congress and the Texas House. Meanwhile, the U.S. Supreme Court agreed to hear an Alabama case challenging a section of the Voting Rights Act that required Texas and other states with histories of discrimination to get federal permission before implementing new election laws and maps. This year, Attorney General Greg Abbott urged lawmakers to ditch their own maps — and the lawsuits attached to them — by ratifying the maps drawn by the San Antonio judges for the 2012 elections. That would have the advantage of halving the number of courts involved in the case and could free the state’s lawyers from fighting the intentional discrimination findings attached to the Legislature’s maps. Lawmakers did that in the first special session. And the Supreme Court ruled in the Alabama case, saying that its formula for which states are subject to preclearance is unconstitutional. Texas was freed from having to prove that its new laws don’t discriminate; instead, the burden of proof moves to anyone suing the state over new laws and maps. That’s where the Legislature left it. But the U.S. Department of Justice has filed briefs with the San Antonio judges saying that Texas should still be subjected to federal preclearance because of those recent findings that lawmakers intentionally discriminated when drawing maps. That, and the state’s arguments against it, are still pending in court, as are the challenges to the maps approved by lawmakers earlier this summer. Election officials are watching the calendar. If the courts take much time working out the legal arguments, those election administrators could find themselves where they were two years ago — delaying next year’s primary elections. The interactive charts below compare the political climates, by district, before and after this decade's redistricting began. The Texas Weekly Index — named for our sibling newsletter — takes the outcomes of contested statewide races over two cycles, averages them, and measures the difference between outcomes for Democrats (shown with positive numbers) and for Republicans (shown with negative numbers). For example, state Rep. George Lavender's district — HD 1 — has a TWI of -31.7 in the new map, meaning the average Republican statewide candidate beat the average Democratic statewide candidate in that district by 31.7 percentage points. In the old map used in 2010, the margin was 27.7 percentage points. We used the 2008 and 2010 elections for our data, because that was available for the old maps.